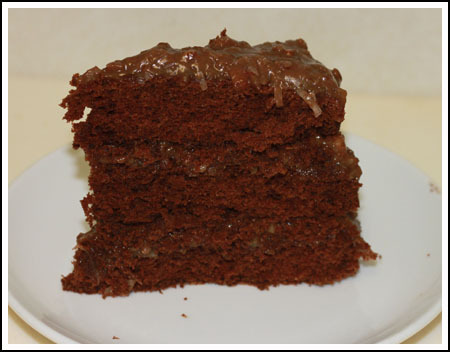 Yesterday I emailed Sue to let her know I was making a recipe she’d given me many months ago, Time Life German Chocolate Cake from the old Time Life Book series. Coincidentally, eerily so since we hadn’t spoke of the cake since, Sue was just pulling it out of the oven. Sue was making the cake for her husband’s birthday and I was making mine for a party with our soon-to-be neighbors. Choosing a recipe was tough. I’d planned on going with Trisha Yearwood’s, but changed my mind. Not only had Sue recommended the Time Life recipe, but it had also been endorsed by someone on Chowhound. I made the cake as directed yesterday, and it did take a while. The layers baked up slightly uneven which normally wouldn’t have been a big deal, but since German Chocolate Cake isn’t completely covered with frosting, I was concerned. Next was the icing. I was careful not to scramble the eggs, cooked it on low the full time, let it cool and was rewarded with a smooth and tasty frosting. But I can’t say it was pretty. The melted chocolate in the icing really muddied up the color. When assembled and chilled, the cake looked okay, but I wouldn’t want to make a first impression with it. Even though I liked the flavor of the icing, I decided rather than save it for the party, I’d serve it for dessert at home. It was terrific! The cake was definitely more chocolaty than your usual German Chocolate Cake, not quite as sweet, but still had the distinct German Chocolate flavor that sets it apart from plain chocolate cake. So in the end, I didn’t serve this cake but re-made it in a new recipe which I’ll share with the neighbors. I’ll post that one later. Time Life recipe can be found on Sue’s Blog, Basically Baked, and here it is again on this Chowhound thread. Anna-That cake looks good to me! 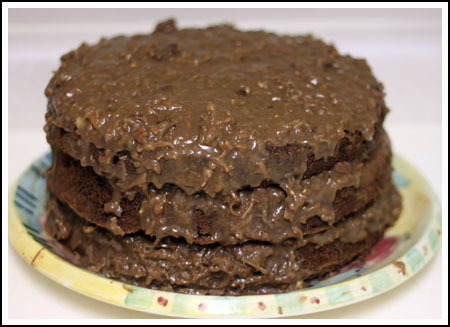 I have made a German Chocolate cake with the coconut/pecan frosting on top and between the layers and the sides frosted with a chocolate icing. So good, but time consuming! I usually use the recipe inside the Baker’s box when you buy the chocolate. That recipe is delicious, but sure will wear your arm out with all the stirring. Hey, where are the sprinkles!? Hee, hee! Katrina, I think it would work great! What would you think of just making one layer in a 9×13 pan, no layers? Yes, that was a bit eerie to receive your email saying you were just pulling yours out of the since I had just made the exact same cake, and we haven’t even been talking about cakes! Yours looks darker than mine. Maybe I overexposed my photo? It’s a really good cake, but I agree with you, it won’t win any beauty contests. If I make it again I might double the frosting to cover it up more.